Home / Bling in the New Year! I’m a bling kind of girl so what better day to post about my favorite bling than on New Year’s Eve the blingiest of holidays. Okay, I’m seriously doing my part to add a little extra bling to Christmas. Halloween will be next, but New Years, what is it without bling! I’m totally addicted to the new Swarovski 2mm round crystals. They have a sparkle that is unmatched by anything else. Since they are tiny and round they easily fit needlepoint canvas. The 2mm round crystals are about the same size as a size 11 seed bead, but oh the sparkle. It makes my heart beat fast. All those places I typically use seed beads, now I use crystals. 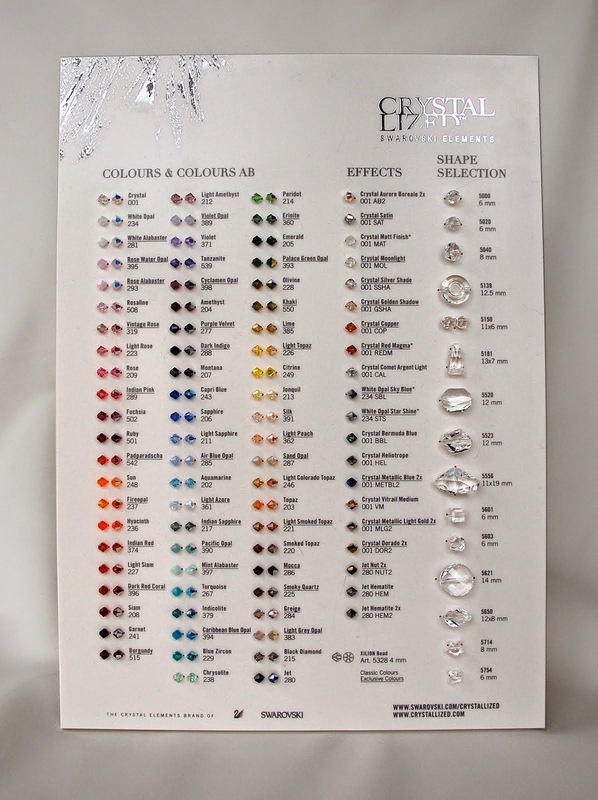 This is the color card complete with real 4 mm crystals sewn on in 80+ colors. Oh my! The 2mm round are not yet available in all these colors but the larger sizes are and there’s plenty of places we can use them in needlepoint too. So, you can see why I had to add the crystals to our store. We have the full line of 2mm in stock now! They're beads. Sew them on just like seed beads and then sit back and watch them sparkle!